We are in the waiting room. I'm bursting at the seams with excitement! "I'm so excited that I just can't hide it." Think sticky thoughts that the embabies and uterus will latch on to each other! We are dressed and ready to go back! Just waiting for them to come get us. 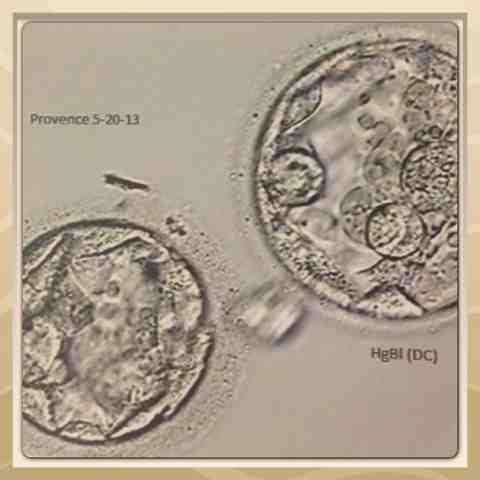 They are transferring 2 blastocysts of grade D quality. They are rated A-F. Most of their babies come from C or D blasts. Blastocyst is the stage after morula. The other 3 aren't even morulas yet. They have to be blasts before they will freeze them, so we will know more tomorrow. We are pregnant until proven otherwise! The procedure is complete, thanks to Dr. Kallenberger! He was very nice. Told us he was going to give us some mood lighting as he turned down the overheads. Afterwords, I told him that I hoped it was as good for him as it was for me. We got a good laugh! The process was definitely uncomfortable! Todd say beside me and let me squeeze his hand. So glad he was here! Now, I'm lying in the bed in the post-op area at an incline with my head below my feet. We are visiting with the other couples behind their curtains. Betty and Ash, from Dr. Bundren's office, are here. She was right before me. Another couple from southern Oklahoma is next to us. This process is entertaining! I'll be upside down for an hour. 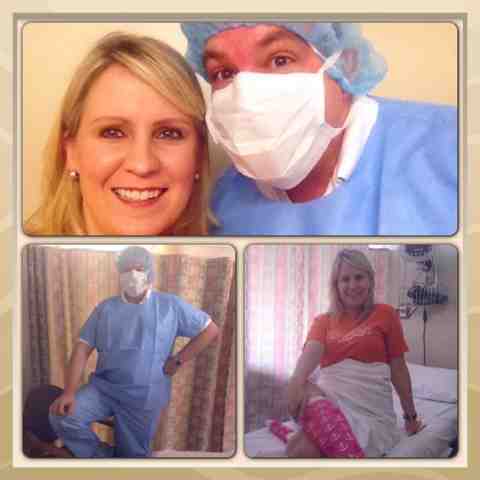 Amber and Brad, our other friends from Dr. Bundren, just went in for their procedure. This is so fun! We have all the curtains open because it's just Dr. Bundren's patients in here. We are all just watching the tornadoes on the news and cutting up together. The nurses said they've never had patients so friendly with each other. I'm enjoying this! All three of us are going to have stories for our babies about the day they were conceived...surrounded by tornadoes! We are trapped in the hospital because of the tornadoes. The southern OK couple that left got stuck in the basement for an hour before getting back up here. I've been in this semi-upside down position for 2 hours, but I don't mind. It's comfortable, and we're still having fun. We did get a pic of our embabies. Meet Baby Provences! We are safely at the hotel, and I'm flat on my back in bed. We're watching the news show updates in Moore. I'm praying no more lives are lost! On one hand, this day will go down in history as one of the worst days in Oklahoma. On the other hand, it will go down in my family's history as one of the most joyous. It's so strange! Betty: Laura, I guess you could say we were both impregnated by the same man. Ash to Todd: And we aren't even mad about it. Todd to Ash: We PAID him to do it! Laura: And you both held our hands and watched!! On a serious note, we are praying for all of the families in Moore! God bless you all. Tar. Gum. Paste. Elmer's. Gorilla's. Post-its, especially the kind you can put on an elephant. Glue. Jessi Spano. Movie theater cup holders. Children after a birthday party. Those sticky creatures we used to stick to walls. Cacti. Caramels. June bugs. Melted candy in wrapper. Old grape jam. Pickle jar lids. That stuff they use to adhere credit cards to paper and samples to magazines. Toffee. Bus seats. Rice crispie treats. Other people's computer mice. Leather car seats in an Oklahoma summer. Cotton candy. Sticky the Clown. And most of all, EMBABIES! That is the wittiest comment ever! I love you, Ashleigh Ross!! Ha ha ha, I just knew you'd get the random "Jessi Spano" reference in there too! :D Also, I had to figure that out and type it up twice cause Blogger didn't like me the first time! I may have also googled "list of sticky things." I don't recommend that. And it wasn't even very helpful. Except for the bus seat thing. HAHA! Hope Todd is entertaining you with a suitably funny clown video! Or cat video. Or people doing silly things, like, um, sticking to velcro walls upside down? If you're lacking, try www.dumpaday.com. Allan's addicted. Oh and obviously I love you too honey! :) So grateful for you. And that you get my humor. Haha! Oh maybe you should also read the old Beatrix Potter book (I think?) about tar babies! May be the only time it's appropriate! We are watching the tornadoes circling us on TV. Looks like I'm staying longer than an hour! I'm about to read www.damnyouautocorrect.com. I'll check out www.dumpaday.com, too! Jessi Spano: I'm so scaaaared. Best SBTB episode ever! Glad you are ok. Scary happenings! Hope you stay safe (and flat)! "Stick babies stick! Stick babies stick!" That's a catchy cheer, Ash! I don't even know who Ashleigh is, but I love her and agree with all the "stickiness." Praying for God's will and protection. LOL Ok now I love your Mom too! I love your trains of thought, Ashleigh! Also, chewing gum that gets stuck in little girls' hair. Honey. Super glue. Those "dang plant burrs," Ashleigh, we call sticker burrs or cockle burrs! You are way too cute. You and Ashleigh win the award for the best comments ever!